Desire Lines are alternate, unofficial routes or social trails in nature and landscape architecture. They represent an accumulated record of disobedience and transformation. We apply this phenomenon to an improvisation practice that maps individual and collective action. The choreographic material is the attention of the performer, a navigation of impulses and fixed systems. The dance offers shifting and emergent models for coexistence, assimilation, and rebellion. Our choices create a world built of its own desires, a provisional utopia constantly making and unmaking itself. 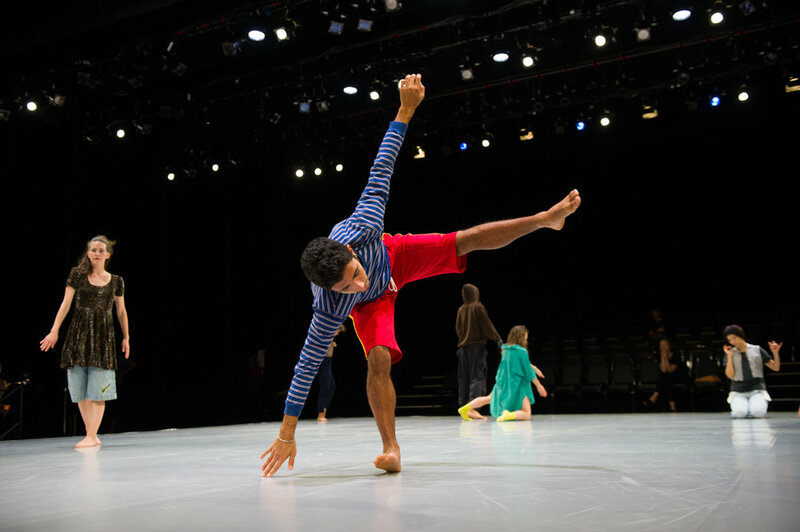 SWITCH, the most recent part of Desire Lines, was presented at The Joyce Theater in October 2018 as part of the NY Quadrille series that transformed the Joyce stage into a large platform that allowed audiences to view work from one of four different sides. Designed, curated, and conceived by renowned choreographer Lar Lubovitch, the series took its inspiration from the eponymous 18th century dance performed in a rectangular configuration and viewed from four sides. SWITCH is a spoke of Desire Lines that focuses on the mechanics of spontaneous creation. The practice challenges individuals to navigate and name codes, contingencies, and layers of memory. It uses discursive pathways to resist culmination, and offers alternatives for patterning community. Quantum Leap. Artforum. Claudia La Rocco. The Playful Legacy of Merce Cunningham. The New Yorker. Joan Acocella. For Desire Lines: translation, Mitchell + Riener worked with Claudia La Rocco to draw connections in the areas of improvisation, collage, task-based modes, mimesis, meditation, and transcendentalism. The work and processes of Robert Rauschenberg, Anna Halprin, Charles Atlas, architect Claude Bragdon, and spirit-medium and artist Ethel Le Rossignol were used as road maps to navigate internal psychological landscapes, external architectural landscapes, and collective desire. Their two-week residency included opening up the rehearsal process to the public in four Open Studio sessions and sharing their improvisational practice in both traditional studio settings, as well as outdoor spaces throughout FSU’s campus. Observers were welcome to come and go as needed, as dancers honed their ability to respond to bystanders not necessarily familiar with contemporary dance practices. Two of these sessions took place during the School of Dance’s weekly Forum. Presented as part of the exhibition "Robert Rauschenberg: Erasing the Rules" at the San Francisco Museum of Modern Art, Mitchell and Riener brought a close circle of movement artists to activate museum space and weigh the resonances between dance and visual art. DESIRE LINES: RETROFIT uses group improvisation to explore path-making, democratic choices, and utopian community, enabling the group of performers to navigate a world built from their own collective desires. Their performances kicked off Limited Edition, a program presented by the museum’s online platform, Open Space. Future Formers, Former Futures. Open Space. Megan Metcalf. Notebook: DESIRE LINES:RETROFIT. Open Space. James Fleming. Danspace Project was invited by artist and MacArthur Foundation Fellowship recipient, Josiah McElheny, to participate in Madison Square Park Conservancy’s thirty-fourth exhibition, Prismatic Park. Danspace Executive Director & Chief Curator, Judy Hussie-Taylor, invited Rashaun Mitchell + Silas Riener to “inhabit” the Park to realize new commissions throughout the exhibition. The project featured three large sculptures of painted wood and prismatic glass on view in Madison Square Park from June 13, 2017 through October 8, 2017. Mitchell + Riener presented a public movement practice that unfolded and accumulated over two weeks. A site-based improvisation world was inspired by the work and ideas of architect Claude Bragdon, theosophist Annie Besant, and spirit-medium and artist Ethel Le Rossignol, and the manifold chaos of mapping a collective consciousness for social change in an urban environment. Together they considered the questions: Can we connect to each other through public space? Can we defy systems of control, find new pathways and move to create better futures? Outdoor Stages: Dance in the Park, Where You Can't Hide Behind a Tree. The New York Times. Brian Seibert. Rashaun Mitchell and Silas Riener Dance To The Soundtrack of the City in Madison Square Park. The Village Voice. Siobhan Burke.